Being an SLP in the days of social media can be a lifesaver. You can get therapy ideas, follow accounts in a certain area (for example AAC) where you’d like to grow, build relationships with other SLPs and find resources (everything from books to read to classes to take) to build your skills. There are so many SLP accounts out there, that it can be difficult to find just the right accounts to follow. Here are five accounts I follow and enjoy to get you started. To choose my top 5 accounts I focused on accounts with consistently good feeds where I’m both entertained and learn something new – the best of both worlds. Gabby is a New York City SLP who works with middle schoolers. As an SLP who often feels like a brain freeze occurs whenever I need to think of a new middle school lesson, I rely on Gabby’s feed when I need inspiration to strike. Jill is a private practice SLP from Pennsylvania who owns a private practice. She also sells products on TPT and is your go-to expert if you are considering starting your own private practice. If you’d like to hear more from Jill, on this episode of our podcast, she talked about what it’s like to own a private practice and sell products on TPT. Jill does a fantastic job with her “research Wednesday” posts where you can get bite-sized helpful tidbits of information from current research. I also love that Jill shares her workouts, which motivates me to get my on workout in. Anne is real, compassionate, artistic, and a true #SLPBoss. I adore her, and feel like she does a fantastic job really showing who she truly is with her account. Follow Anne because you want to get to know this lovely human better, but stick around because she knows what she’s doing on Insta, and we’ve all got a lot to learn from her. This account is a treasure trove of ideas for your AAC learners. I’ve especially learned a lot from these Insta Stories, as it’s been helpful to see AAC systems in action. This account is run by Kristen Powell, an SLP in Southern California who works with assistive technology and AAC in the public school system. 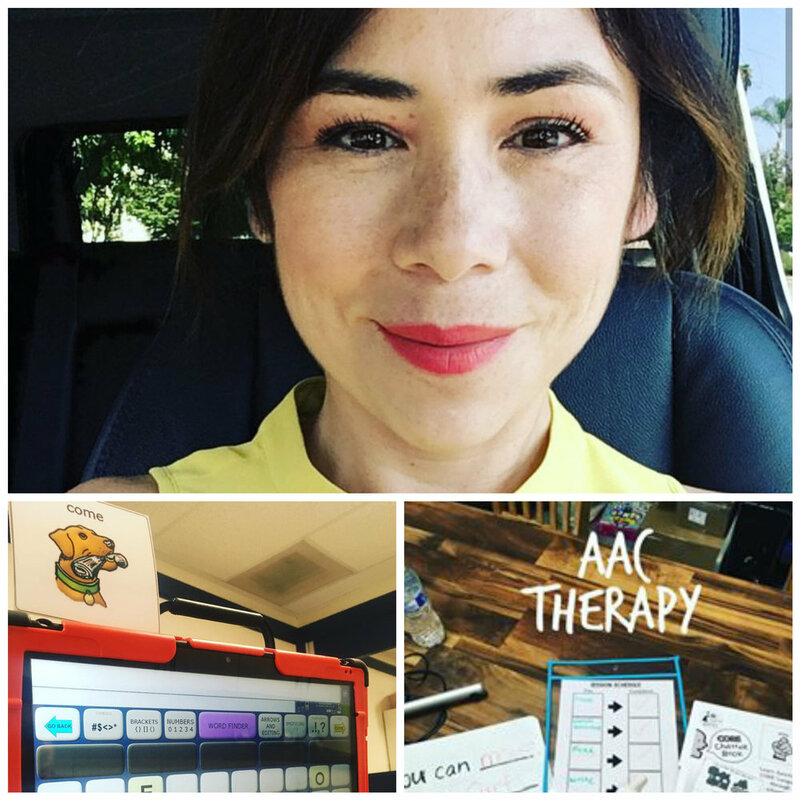 Kristen also has a ton of IG Highlights full of information on a variety of topics, including: AAC assessment, AAC therapy, Q and A on AAC, and communication boards. Carly is an SLP from Vancouver, British Columbia (one of my favorite cities!) who shares ideas and activities for early learners. I’ve gathered some great ideas for my youngest learners from her Insta Stories, and she focuses on simple and effective activities to help your learners improve their speech and language skills. I especially enjoy Carly’s songs and rhymes that she shares on her feed. What are your favorite IG accounts? Hit me up on Instagram and share yours! If you like posts like this, I’d be happy to share more. 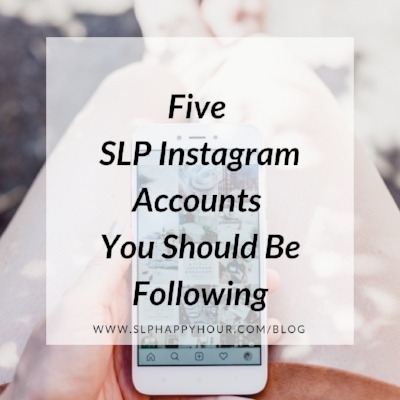 There are way more than five SLP Instagrammers I love following! This list is just a getting started point. Being able to see what other SLPs are doing in their sessions has really been a helpful educational experience for me. If you are interested in starting your own SLP IG account, I would really encourage you to do so. I’ve made so many connections with other SLPs through this social media platform, and I’ve learned so much! A Freebie Just for You! Want to up your social media game? If you are an SLP Boss or are starting an Instagram account, I’ve got you covered. I created a downloadable freebie with 30 days of topic post ideas for social media. You can get it in our newletter members-only area on our website, which you will have access to when our next email newsletter goes out if you sign up here. Want even more ideas? I couldn’t leave it at just five, so you can find 15 great SLP accounts on IG listed below.